Happy New Year from BioGPS! It’s been an interesting year for BioGPS. Looking back at 2015, the BioGPS paper was cited 754 times according to google scholar. Of those citations, 137 were in 2015. The BioGPS application paper about BioGPS and MyGene.info from 2013 was cited 40 times this year for a total of 96 citations. An update on BioGPS was accepted for publication last year and should appear in this year’s database issue of Nucleic Acids Research. BioGPS had a major overhaul in June, with thousands of additional datasets added from Array Express, which allowed the user to customize the gene expression charts based of factors of interest. Additionally, charts from datasets with multiple samples could now be viewed with the individual samples collapsed together with an error bar. BioGPS logging was down during parts of July and August, hence the actual number of queries made last year is not available. 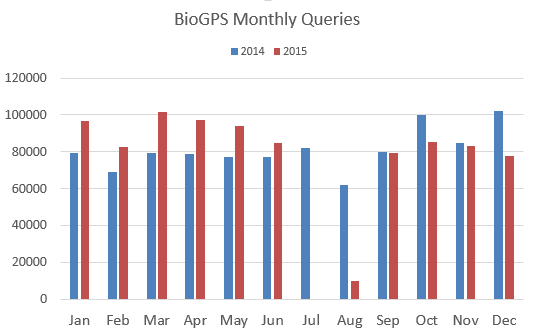 Using the remaining 10 months to estimate the average monthly queries and then projecting that average to 12 months, BioGPS received an estimated 1,060,944 queries last year—up from 972,401 queries in 2014. Although logging was down during parts of July and August this year, the actual number of queries made in 2015 is expected to have increased. For those of you that used BioGPS, created a plugin, contacted us about a bug, shared or tweeted about BioGPS, or made a suggestion… THANK YOU! If you’ve published a paper citing BioGPS and would like to share more about your research, we’d love to feature your work on our blog, so please get in touch! We look forward to hearing from you in 2016. Dear Dr. Su, I noticed this morning that BioGPS cannot be logged in. Are you maintaining the website now and when it will be available please? We’re really sorry for the inconvenience the outage is causing you and we’re currently investigating the problem. We’ll post updates on the fix as soon as it becomes available both to twitter and to our BioGPS google groups.